The Ultimate Tool for MINDSTORMS® Maniacs The new MINDSTORMS kit has been updated to include a programming brick, USB cable, RJ11-like cables, motors, and sensors. This book updates the robotics information to be compatible with the new set and to show how sound, sight, touch, and distance issues are now dealt with. The LEGO MINDSTORMS NXT and its predecessor, the LEGO MINDSTORMS Robotics Invention System (RIS), have been called "the most creative play system ever developed." This book unleashes the full power and potential of the tools, sensors, and components that make up LEGO MINDSTORMS NXT. It also provides a unique insight on newer studless building techniques as well as interfacing with the traditional studded beams. Some of the world's leading LEGO MINDSTORMS inventors share their knowledge and development secrets. You will discover an incredible range of ideas to inspire your next invention. 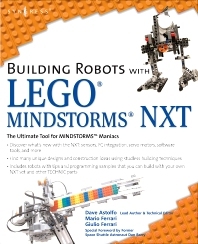 This is the ultimate insider's look at LEGO MINDSTORMS NXT system and is the perfect book whether you build world-class competitive robots or just like to mess around for the fun of it. Chapter 5: What’s New with the NXT? What Is the NXT Programmable Brick? Dave Astolfo (GIS A.S.) is a Project Manager / Business Analyst with the technical arm of a North American environmental consulting company. He currently provides project management, technical consulting, database design and software architecture with a focus on Geographic Information Systems ranging from desktop mapping software, web mapping portals and mobile software applications. His specialties range from database modeling, software design / architecture. Dave is a key contributor to the business development and implementation of products and services. As such, he develops enterprise-wide technology solutions and methodologies focused on client organizations. Dave holds a bachelor’s degree from Trent University and is a certified Geographic Information Systems Applications Specialist holding a certificate from Sir Sandford Fleming College. In early 2006, Dave was invited by Lego to participate in the Lego Mindstorms Developer Program (MPD) to help Lego beta test the pre-release of the Lego Mindstorms NXT robotics system. After the release of the NXT, Dave was invited back to participate in the Lego Mindstorms Community Partner Program (MCP) to work with Lego in developing the product further while and providing an ear to the community. Dave has been involved with Lego all of his life, and has been working with the Mindstorms product since the initial release of the Lego Mindstorms Robotics Invention System (RIS) in 1998. Dave is well known for building a Mindstorms domino-placing robot which was published in a previous Syngress book (10 Cool Lego Ultimate Builders Lego Mindstorms Robots). Since then, he has created newer versions with a more recent NXT version being used by Lego marketing staff in Europe. Visit Dave’s site, www.plastibots.com, for more information on his work. Giulio Ferrari is a student in Economics at the University of Modena and Reggio Emilia, where he also studied Engineering. He is fond of computers and has developed utilities, entertainment software, and Web applications for several companies. Giulio discovered robotics in 1998, with the arrival of MINDSTORMS, and held an important place in the creation of the Italian LEGO community. He shares a love for LEGO bricks with his oldest brother Mario, and a strong curiosity for the physical and mathematical sciences. Giulio also has a collection of 1200 dice, including odd-faced dice and game dice. He studies, works, and lives in Modena, Italy.